HUBBALLI: In an effort to clear the air, AICC secretary Shakir Sanadi, who missed party ticket to contest the Lok Sabha elections from Dharwad constituency, noted that the Congress never neglected minorities. Speaking to presspersons here on Wednesday, Mr. Sanadi said that he indeed was an aspirant for the Congress ticket but he would abide by the decision taken by the party high command in this regard and work for the victory of the party candidate here. He said that the party had finalised the candidates after carefully studying the pros and cons involved. 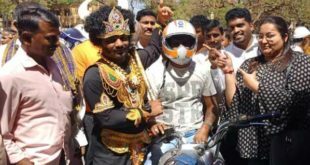 As the party candidate Vinay Kulkarni is expected to mobilise the Lingayat community votes for the party, it is calculated that the Lingayat and minority votes would help the party win here. Therefore, all efforts would be made to convince the Muslim community voters to vote for the Congress, the only party with genuine concern for the minorities, he said.